The mid-term Congressional elections are eight months away. Voter registration activists fanned out among young Americans who marched for tighter gun laws on Saturday, signing up thousands of first-time voters who vowed to eject lawmakers who oppose gun controls. 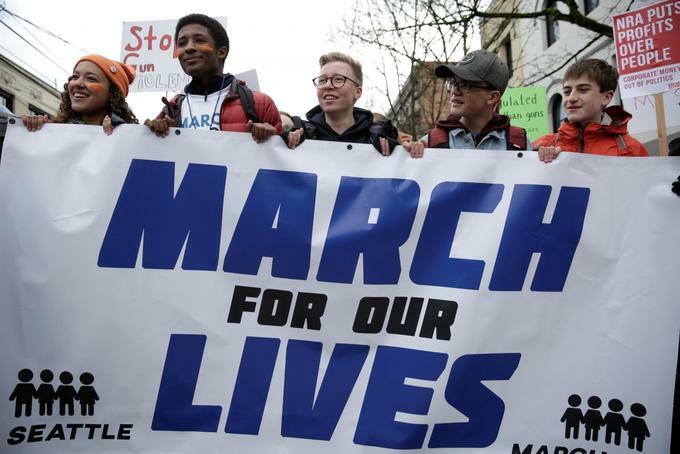 With mid-term Congressional elections eight months away, the activists flocked to some 800 marches across the country to enroll young voters likely to back Democratic and independent candidates who tend to favor tougher firearms laws. In Washington, volunteers for the HeadCount voter-registration effort raised their fists and chanted "demonstration without registration leads to frustration" before heading out with clipboards to sign up some of the nation's newest voters. "Parkland's Emma Gonzalez called for more Americans to vote and that is why Headcount is here today," volunteer Aaron Ghitelman, 26, said of the student who along with classmates forged a national, youth gun control movement following the Feb. 14 massacre at her high school in Parkland, Florida. "The more I see people marching and standing up for a cause I believe in, I want my voice to matter, too," he said at the Washington march, adding that gun violence was a menace in his community. "If there is no assault weapons ban passed, then we will vote them out," Delaney Tarr, a senior at the school, told marchers in Washington. At a rally in Chicago, 17-year-old Kara Sharp from Island Lake, Illinois, carried a sign reading "Protect students not guns - 2020 Voter" after traveling to the event with her father, a 53-year-old machinist. Volunteers from a local chapter of lobbying group Indivisible435, which backs progressive political candidates, told her how to register to vote once she got home, as she did not have her driver's license with her. "It's time to disarm hate. I'll be looking at NRA ratings of politicians and also how they treat LGBQ issues," said Sharp, a junior at Wauconda High School, referring to the grade the National Rife Association gives members of the U.S. Congress for their voting record on gun rights. In Parkland, Florida, Sari Kaufman was among students from Marjory Stoneman Douglas High School -- where the mass shooting took place -- who urged peers to get involved in politics, register to vote and turf out lawmakers who did not protect them. "With this movement, we will ensure record-breaking turnout not just in the next presidential election, not in the next midterm election, but in all elections," Kaufman told a crowd of thousands at a rally in Parkland. "We're here today to give you the tools to make a change."